Alexandria City Hall is located at 915 Third Street, Alexandria, LA 71309; phone: 318-449-5048. 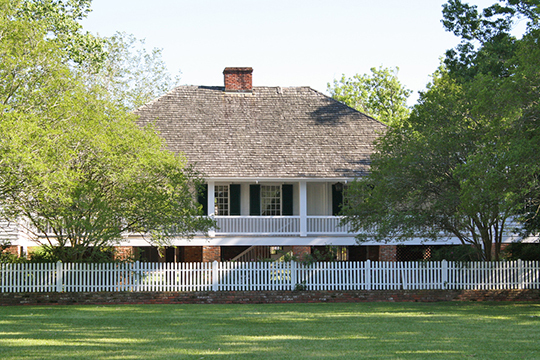 Photo: Kent Plantation House, ca. 1800, 3601 Bayou Rapides Road, Alexandria, LA. Listed on the National Register of Historic Places in 1971. Photographed by user:Tjean314 (own work), 2012, [cc-by-3.0 (creativecommons.org/licenses/by/3.0)], via Wikimedia Commons, accessed December, 2015. Alexandria, on the north bank of the Red River, is in the geographic center of the State in the midst of a rich agricultural section. Often called the Hub City, it is fifth in size in Louisiana. Luxuriant vegetation is the dominant visual note. Flowers bloom through the winter, and the fame of local gardens increases yearly. Magnolia, camellia, japonica, cape jasmine, hydrangea, azalea, yaupon, and wisteria bloom luxuriously. Even more abundant, lining streets and providing safe shade and color on lawns and in parks, is the crape myrtle, rivaled only by the native redbud, which has been transplanted from surrounding pine forests. Buildings in Alexandria, with few exceptions, are of fairly recent origin. The town was almost completely destroyed by fire during the Civil War. One business establishment, on Second Street, retains the iron grillwork of an ante-bellum structure, and similar grillwork, taken from a group of buildings on Front Street which were torn down for construction of a set-back levee, has been incorporated into some recently constructed homes. Because of the rapids in the Red River at this place, it was called Les Rapides by the French and El Rapido by visiting Spanish Franciscans from Los Adais. After the founding of Natchitoches (1714) the Red River became an important trade route. With increasing traffic, a modest military post was established to protect portage at Les Rapides. A trading settlement gradually developed around the stockade. In the 1760s, a group of Appalache Indians, unwilling to live under the British, to whom their land near Mobile was ceded in 1763, moved to Les Rapides, where a chapel, known as St. Louis des Appalages, was established for them by Capuchin monks. By this time, various racial strains were already represented at the settlement. French soldiers, from Canada, had taken up land grants and become small-scale planters and traders, and the first Acadian exiles had arrived. Spanish officials and traders established themselves at the post after the transfer of Louisiana from France to Spain. After the Louisiana Purchase, Anglo-Saxon pioneers streamed in from the Atlantic seaboard, many of the families homesteading in the surrounding pine forests. The town was formally laid out about 1810 by Alexander Fulton, a wealthy landowner and merchant, and named in honor of his infant daughter. During the following decade, with increasing steamboat traffic, the town developed into a busy shipping and trading center. Adjacent forests were cut down to provide lumber for fast growing New Orleans, and vast acreages were planted in cotton, sugar cane, and other crops. Under French and Spanish rule, all except the Roman Catholic faith had been banned. The first Protestant minister to preach in Alexandria was an ex-blacksmith, John Shrock, who precipitated a near riot at the courthouse when he held a service there in 1814 in the face of bitter opposition. By the middle of the 19th century, several Protestant denominations had built churches in the town. Only the Catholic church was left standing at the close of the Civil War, and that remained because of the defiant protection of Father J.G. Bellier, an ex-cavalry man and accomplished fencer. In 1819 a school with the ambitious name, College of Rapides, was established on land donated by John Casson. With the opening of a bank in 1824, Alexandria began to take on the air of a metropolis — as indeed it was, for central Louisiana. That same year, the Reverend Timothy flint, formerly of Massachusetts, arrived to teach in the college. What is said to have been the first railroad west of the Mississippi River was begun in 1837 by a planter, Ralph Smith-Smith. Approximately 40 miles long, the line ran from Alexandria southward to Bayou Hauffpauer, near Cheneyville, and brought cotton and sugar cane from the plantations of lower Rapides Parish to steamboats on the Red River. In 1849 a steam ferry between Pineville and Alexandria replaced a ferry powered by blind horses plodded around a circular treadmill. Works Progress Administration, Federal Writers' Program, Louisiana: A Guide to the State, American Guide Series, Louisiana State University and the Louisiana Library Commission at Baton Rouge, 1941.